Visit to Sapphire Rush East of Ambatondrazaka, Madagascar. 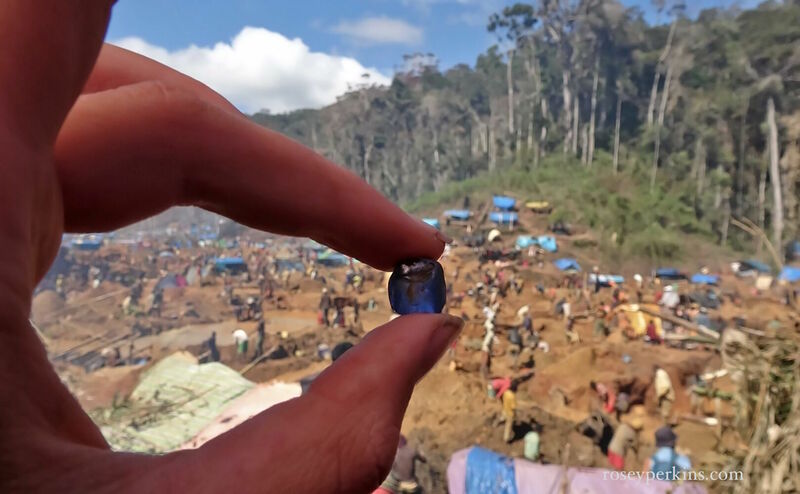 “A sapphire rush escalating to approximately 45000 miners has occurred in the Eastern Madagascan rainforest. On 23rd October I gained access from the nearby town Ambatrondrazaka, where I had been shown large sapphires of varied colours by foreign traders. I left the town by motorbike for a nearby village called Ansevabe. It was then a 11 hour walk to the mine site into an area which is in theory protected for conservation. We walked alongside miners and women carrying supplies and food to sell to the miners. The valley opened to reveal a clearing in which people were building make-shift tents, feeding fires and digging. They collected potentially gem rich earth which they sieved to wash the dirt away and reveal the gravel in which they hoped to see gems. Stones were often large, and traders often took up place on the side of the hill so they could easily spot success. I was in the tents of some traders when they were approached by miners with some sapphires. Some miners were professional and had travelled across the country to reach the mine site, others local making the most of the opportunity to earn some extra income. They worked together in teams of 4-5, digging several meters to shift the surface soil on order to reach the gem bearing layers further down. The Gendarme were present to oversee the area and keep peace, with such a large gathering, they could do nothing more. It would be a blessing for the Malagasy gem industry and the local people if the area was not protected but in reality, that region East of Ambatondrazaka is part of a biodiversity conservation corridor, which is vital for the rare and endangered species living there. Boehm E. 2013. Colored Gemstone Ethical Fair Trade & Sustainability. Chubb Collectors Newsletter. Rakotondrazafy & al. (2008). “Gem Corundum Deposits of Madagascar: A Review.” Ore Geology Reviews (34): 134-154. Walsh, A., (2012) “Made In Madagascar: Sapphires, Ecotourism and the Global Bazaar.” University of Toronto Press.